Trump Walk of Fame Star Vandal I Have NO Regrets ... Even De Niro's Got My Back!!! The latest man to take a pickax to Donald Trump's Hollywood Walk of Fame star says he was so fed up with the President he had to let it all out, and despite getting arrested ... he's happy he did. Austin Clay tells TMZ ... POTUS' treatment of immigrant families was the spark that set him off, and taking it out on Trump's star seemed like the perfect way to send a message. It's unclear if Trump got the message, but Clay and his GF say his pickax attack caught the eye of a couple celebs ... including noted Trump foe Robert De Niro. As we reported, Clay was arrested after destroying the star around 3 AM Wednesday and calling the cops on himself. OG Trump star vandal, James Otis, offered to pay his $20k bail ... but Austin tells us he was released this morning after someone else did. He didn't say who. 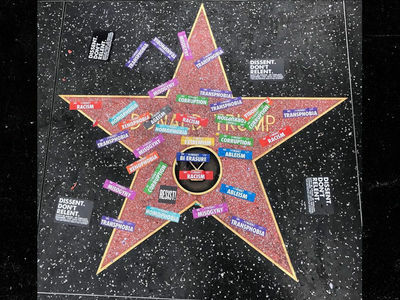 As for Trump's star ... it cost $3k to replace, and the Hollywood Chamber of Commerce will be going after Clay for the bill.